Columbus, OH, October 19, 2018 - Erin Gyurke has dedicated many years to The Ohio State University Buckeyes’ Cross Country and Track Team and is our student-athlete of the week. 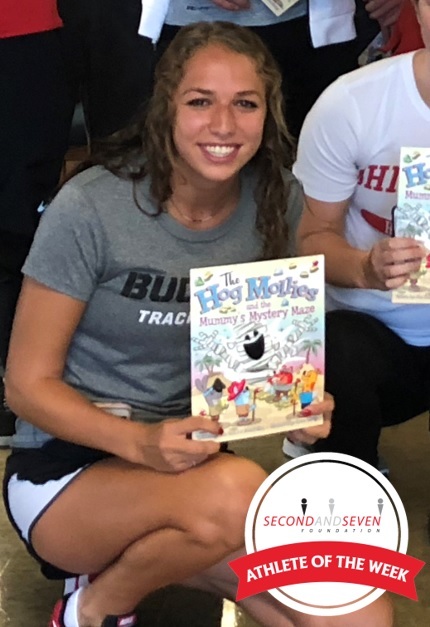 As a fifth-year early childhood education major, Erin truly shines in the classroom as a frequent student-athlete reader in our central Ohio program. She says, “2nd & 7 has shown me that I am more than just my sport. I have a position that can be utilized to help motivate and encourage others. The most impactful part for me as an athlete is getting the opportunity to discuss the different dreams of the second-grade students. They talk with such excitement and passion for jobs ranging from professional athletes to bounty hunters, to bakery owners.” However, the impact is mutual; her conversations with the students leave her feeling determined to tackle her next challenge, whether that be a race or an exam. She says she’s made countless memories throughout her four years with 2nd & 7. After graduation, Erin will frequent the elementary school classroom a bit more, as she plans to become a teacher. If her impact in the classrooms as a volunteer with us is any indication of what her future may hold, we know she’ll continue to make a difference in many young students’ lives.